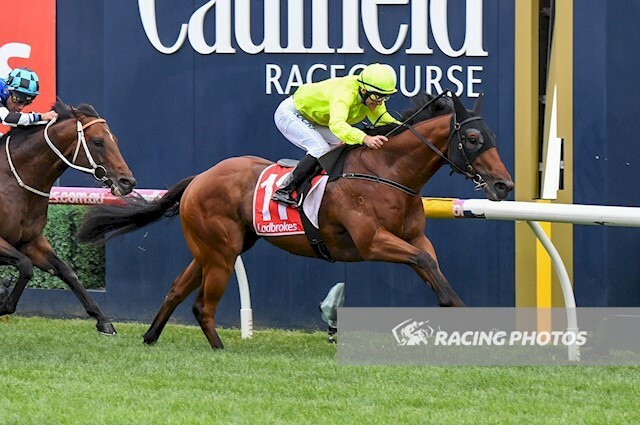 Trainer Tony McEvoy’s Manuel proved he was no bumbling waiter by serving up a galloping lesson to his star-studded rivals with an all-the-way win in the Group One $500,000 C F Orr Stakes (1400m) at Caulfield on Saturday, February 9. Specked from $31 into $21, Manuel was superbly rated by Luke Currie to score a half-length win from Group One winners Kementari ($2.50) and Land Of Plenty ($7.50) with another Group One winner Brave Smash a short half head away fourth. The Orr victory should boost the five-year-old’s chances of making the field for The All Star Mile later in the autumn. Currie worked on Manuel to find the lead then rated him perfectly. In the home straight the challengers loomed but none could run down the courageous McEvoy-trained galloper. “Dad’s the one who has had all the time and patience in this horse and had so much faith in him,” said assistant trainer Calvin McEvoy. “He will be over the moon. “I remember we ran him in the Maribyrnong Trial as a two-year-old (in 2015) and we were so confident he would win that race. Manuel was gelded before his autumn campaign last year and McEvoy believes that was the making of him as a racehorse. “He’s a horse we’ve had so much time for. We came here today as the outsider but what a ride by Luke (Currie). He just got to the front and didn’t have to do too much to get there and he was strong to the line. McEvoy said they were keen to get Manuel into next month’s inaugural $5 million All-Star Mile at Flemington. The gelding had been failing in his ultimate autumn quest – the $5 million All-Star Mile – as he was languishing in 55th spot with just 197 votes before the Orr but the win lifts his profile and even gives Racing Victoria officials something to think about when they hand out the four wildcards as he is now a Group One winner. Manuel even has his own video presentation to attract votes with the stable even trading on the success of Fawlty Towers and its famous Spanish waiter by the same name. Currie said when Manuel gave a good kick off the home turn his confidence grew. “I knew he was going to be hard to beat from there because I know how tough he is when he’s in front,” Currie said. “He got a lot of confidence from a win back here mid-spring and it culminated in a Kilmore Cup,” he said. “The edge off the track today really brought him into the race as did the barrier (three).